General Motors announced that it will be integrating Apple's Siri voice control system in two of its 2103 models - the Chevy Spark and Sonic LTZ and RS models. They will come with Siri's Eyes Free regime, that was announced during Apple's WWDC event, pairing up an iOS 6 device with the MyLink infotainment system. It says a lot about our commitment to small-car customers that Chevrolet has announced that Siri Eyes Free capability will be available in the Spark and Sonic well before the luxury brands. Safe, easy, reliable and portable connectivity is a top priority for our customers, and Siri complements MyLink's existing capabilities to help deliver an incredible driving experience. No reason to buy GM anyway, even less of a potential for one now. Siri or not, I've never been fond of their cars anyway. I've always prefer Dodge and Ford to them. I'd never refuse a Camaro though, but If I had to choose, I'd rather take the Challenger instead. Or even the GT500. I tend to like Chevys, but I would not get the Camaro. They look cool, but they have too many problems. It is too heavy, too slow, and has a tendency to understeer. The 6.2 L V8 is only theoretically capable of around 800 hp, while the 5.0 L ford engine is theoretically capable of up to 1000 hp. The Shelby is also lighter and has a better front suspension geometry. These allow the front to hold on and the back to kick out for some muscle car fun. The Mustang also has better stock superchargers, and is capable of much greater speed for a lesser amount of money. hell yea...they will just cryy in car fr not havin an iphone .now i have more excuse to get back an iphone . "Eyes Free keeps your screen shut to avoid distractions, but Siri helps you make calls, send messages, check your calendar, play music and so on." do you realize the irony in that lines?? Depending on how it is integrated it can be more of a distraction than a help. I like how Ford does their Microsoft Sync system, all hands-free and with steering-wheel controls for radio and stuff so eyes can stay on the road where they belong. Ok so ur for it as long as its done rite. You ever heard or seen a warning sign cautioning people not to call or text while driving?? It's even banned in most countries and you know why? Because it's a distraction to the driver in case you haven't heard. So what's the point in having those features when infact, calling and texting are distractions?? Haha...man! You are amusing sometimes! I wonder if you're a kid. this is classic! General Motor will be gettin a few returns from android users.. LOL.... ima need SIRI in Range Rover and i'll be a HAPPY HAPPY Camper #TeamIphone B*tches!!!! When an iDevice Era is over then infected the GM and becoming iGM, which is later on tax payer will bailout all the iProduct - including Tim Cook's mansion. Dude just shutup please. Pleeeeaasssssssseeee!!!! This is LAME. I'm tired of companies adopting proprietary technology, then forcing consumers to use their producs (Apple) in order to get the most from the system. 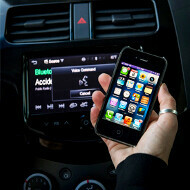 GM should be using a device agnostic system that can sync with any smart phone.. not just Apple. Awwwww hush. If it was google voice you'd b just fine with only that. The Chevy Spark does sync with Android. The two apps available on the mylink work with apple, android, and blackberry. Sadly not WP7 which I use, but that is because they don't have pandora or sticher or onstar in their App store. This is just adding another feature that the iPhone has and when Google's voice command becomes more popular I am sure it will work with that too if it hasn't already. I can confirm right now that I am able to use hands free texting with voice commands with my WP7 on my Chevy Spark as long as the phone is connected by bluetooth and the radio is set to the phone as its music source.. I have posted the same feelings in other blogs as well as to General Motors. On a marketing perspective, it does no good to make a non-Apple or Non-Android product strictly indigenous to only one platform. Cars, appliances or any other non-proprietary product that uses remote capability of mobile devices, should be able to adapt to multiple OS platforms in order to open up wide spread sale potential. John B. Or the fact that Android has significantly a larger piece of the market share. If it works with all devices I am game for it. However based on Apple's normal MO, I expect it will only work with IOS devices. AGREED! I dont care who makes the system, just would like it to play fair with everyone.